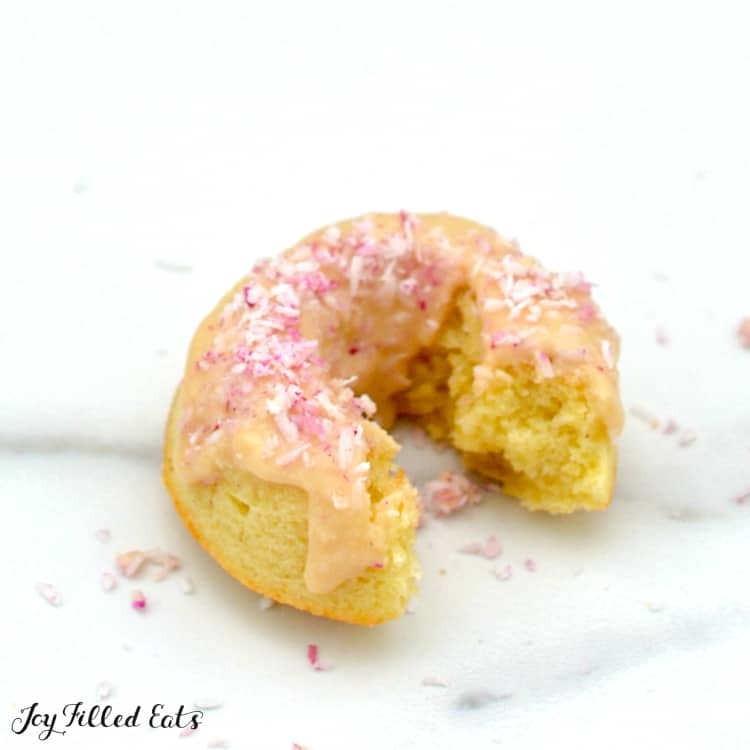 Posted January 22, 2019 Last Edited January 23, 2019 By Erin M.
These Vanilla Donuts with Toasted Coconut Glaze donuts are buttery and delicate and have a delicious almond taste from the almond flour and then also a strong coconut taste from the toasted coconut glaze. The are a great breakfast or brunch treat, snack, or dessert! Hi, Joy Filled Eats community! 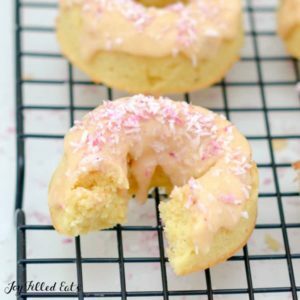 Erin from My Flourless Kitchen here and I am thrilled to share with you this recipe for Vanilla Donuts with Toasted Coconut Glaze. At work, we have Donut Day on Fridays where they bring in bags and bags of donuts and muffins for everyone to celebrate it being Friday. Also probably to encourage people to get in early on Friday since all the good ones go quickly! Donut Day is something we take very seriously at work and they wouldn’t dream of taking it away for fear of mass riots. The first donut to go is always chocolate glaze (obviously) and then the honey glaze and jelly filled. I go for the toasted coconut ones myself as I have always been a big coconut fan. To make the toasted coconut glaze you need a food processor or a high powered blender. If you don’t have either of those, you can buy coconut butter at the store and melt it down and add some sweetener. It just won’t be *toasted* coconut glaze but it will still be delicious. If you don’t like toasted coconut you could always try a different topping. You can make a vanilla glaze by mixing 1/3 cup powdered sweetener with 1 tbsp of water and a splash of vanilla. I also often drizzle these with a generous amount of my (killer) brown butter salted caramel. 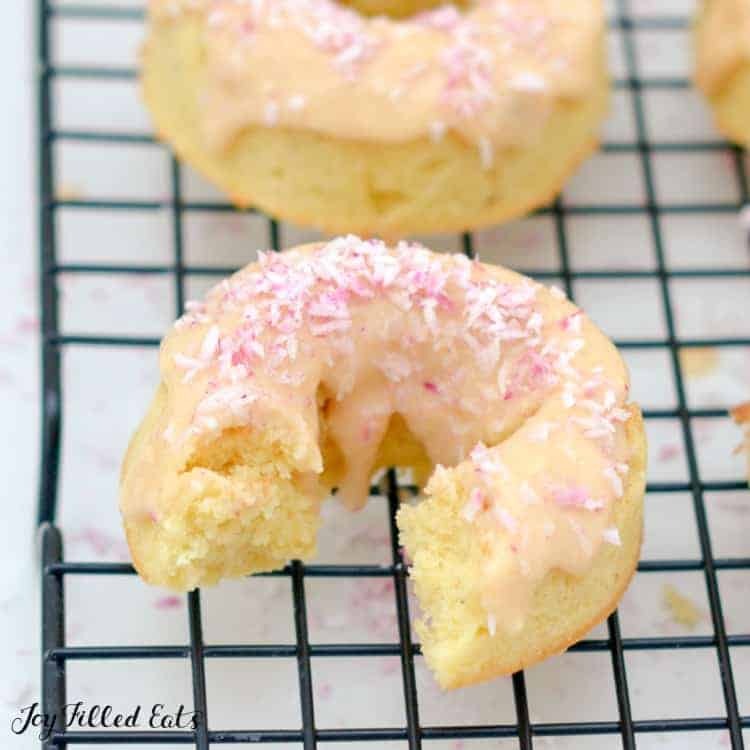 I use my silicone donut pan to make these vanilla donuts but if you don’t have one of those, you can use a muffin tin and just filling the cavities halfway. 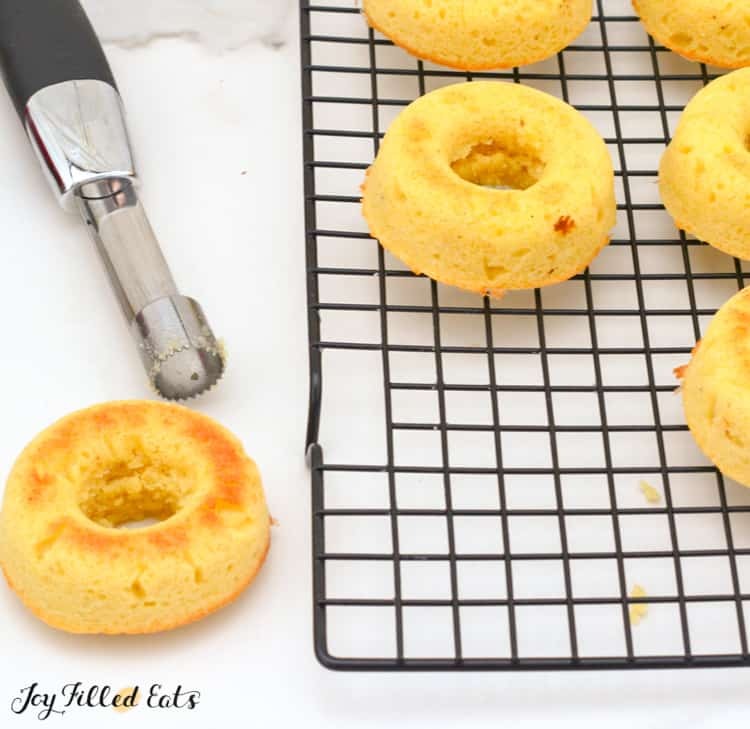 The advantage to using a muffin tin is that you can put a dollop of something delicious in the middle and make filled donuts. Raspberry jam is an idea or my homemade Nutella would be delicious! If you want perfectly shaped donuts, don’t overfill the cavities in your donut pan because this batter does rise and fluff up a bit. 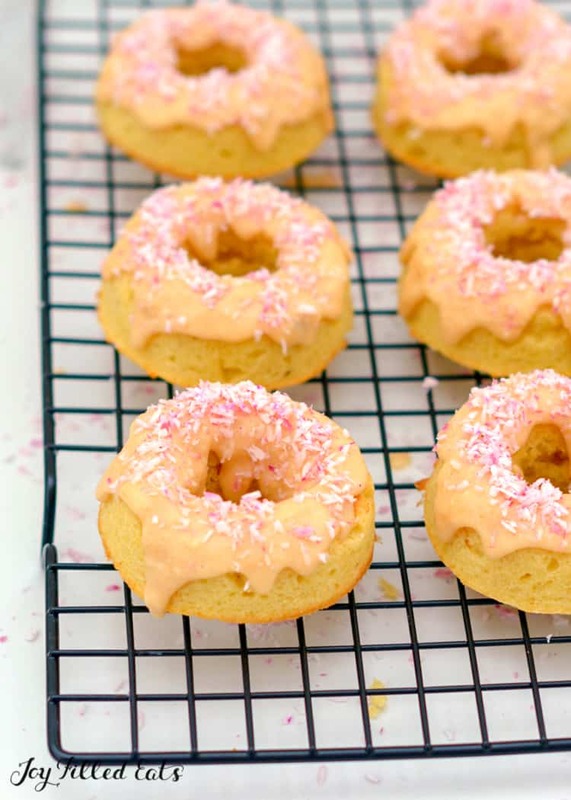 If you accidentally do overfill the cavities and the donut holes get filled in, you can use an apple corer (or a small knife) to cut the hole out and make perfectly cute donut shapes. Or you can just leave it and then you get a little bowl in the middle to hold extra toasted coconut glaze! If you want to get fancy you can sprinkle some toasted coconut on top of the toasted coconut glaze for a double hit of toasted coconut. 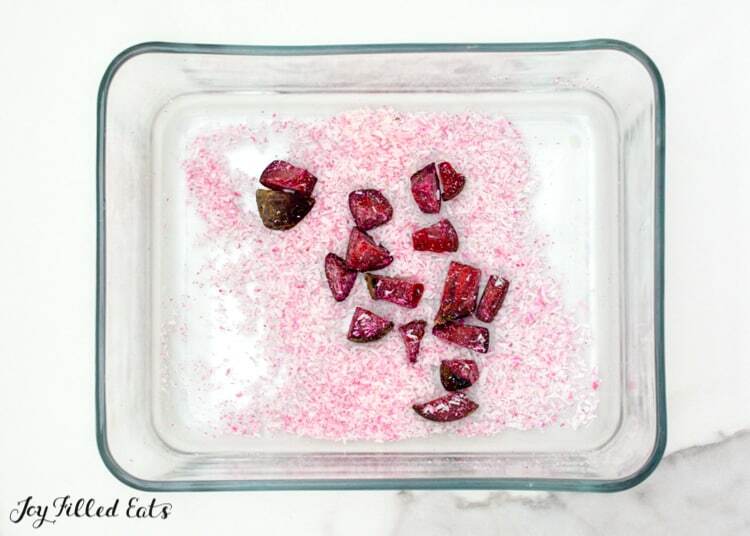 Or – for something fun – you can use my method for making pink coconut. I have been working on something fun to sprinkle on top of donuts and cupcakes for a while now and I finally figured it out. Who needs those store-bought sprinkles full of sugar and preservatives and artificial colors when you can make your own pink coconut! I first tried making pink coconut by pressing the juice out of cooked beets and adding it to a bowl of shredded coconut, which worked but was too much effort. Then I tried finely grating a raw beet and adding that to a bowl of shredded coconut, which also worked, but then you were left with shriveled up bits of beet that had a weird, dried out texture. Now all I do is chop a raw beet into small chunks and add that to a bowl of shredded coconut and leave it overnight. Then in the morning you can pick out the beet chunks and are left with pink coconut. Easy! 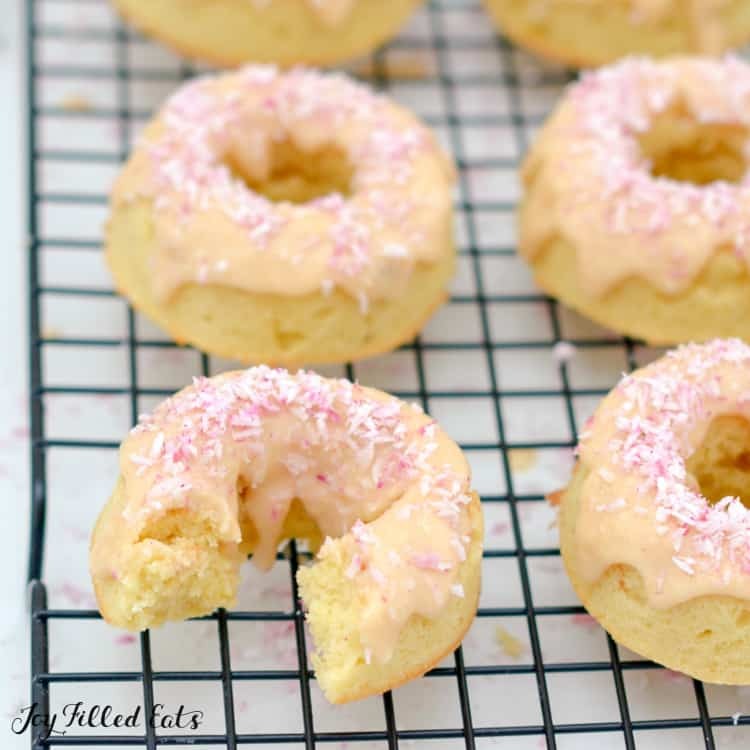 This is a small recipe that only makes about 6 or 7 small donuts. They are pretty rich and filling so that is enough to get you through Friday morning and well into the weekend! If you want to make a bigger batch, you can easily double the recipe and get a full dozen. Or if your donut pan is bigger, add a couple of minutes to the cooking time. These Vanilla Donuts with Toasted Coconut Glaze donuts are buttery and delicate and a great breakfast or brunch treat snack or dessert! Combine dry ingredients in a bowl and mix thoroughly. Add eggs, vanilla and melted butter (that has cooled) and mix gently by hand just until combined. Use a spatula to fill the cavities of a donut pan about halfway full. Toast coconut in the 350 degree oven for 5 minutes until it is golden brown. Add toasted coconut and sweetener to your food processor or blender and whiz it up for a few minutes, scraping the sides a few times until it turns into a smooth, thick paste. I like to just use a spoon to drizzle the toasted coconut glaze onto the donuts. It hardens as it cools so quickly add your pink coconut before it sets! I made these for family members doing a Keto. They were a hit and quickly disappeared! What kind of powdered sweetener are you using for this recipe? I hate the taste of sweetners and not sure which one will work the best. Thanks! I normally use powdered swerve. How do I view comments from other viewers? I like to see them before trying a new recipe and just can’t find them on your recipes. Thanks! This is a brand new recipe so there aren't comments yet. Some other recipes have dozens. They are always below the recipe card.